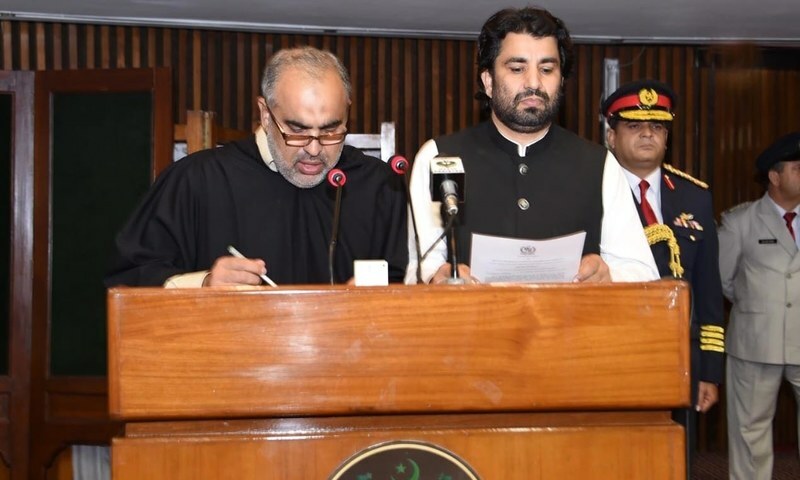 Pakistan Tehreek-i-Insaf's (PTI) Asad Qaiser and Qasim Suri were sworn in as National Assembly (NA) speaker and deputy speaker respectively on Wednesday, beating out the joint candidates fielded by a fragile opposition alliance in a secret ballot. Qaiser, a former speaker of the Khyber Pakhtunkhwa Assembly, received 176 votes to PPP stalwart and joint opposition's candidate Khursheed Shah's 146. Eight votes were rejected in the tally. The election for the post of deputy speaker was also won by a PTI candidate: Suri. He garnered 183 votes and edged out Muttahida Majlis-i-Amal's (MMA) Maulana Asad Mehmood, who received 144 votes. After the announcement of Qaiser's victory, the new NA speaker made a round of the opposition benches and shook hands with PPP, PML-N and MMA leaders seated in the front rows of the assembly. 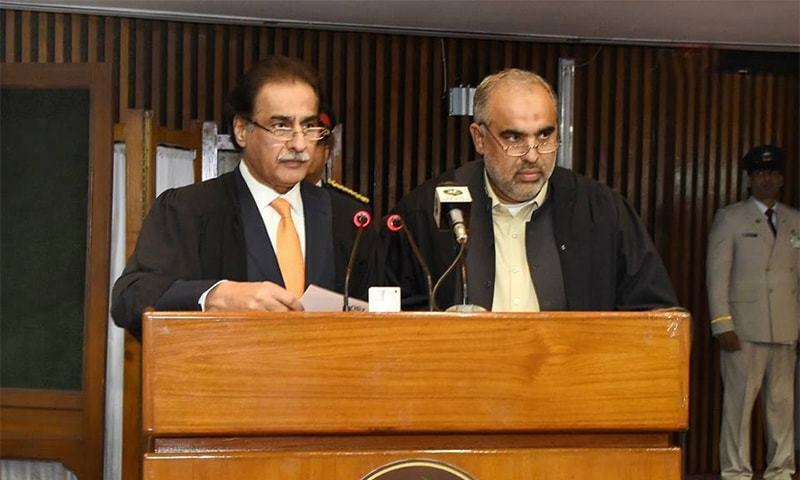 Outgoing speaker Ayaz Sadiq subsequently administered the speaker's oath to Qaiser amidst loud chants of vote ko izzat do by PML-N lawmakers. Meanwhile, the oath to the new deputy speaker was administered by the new speaker and his fellow PTI leader, Qaiser. After taking oath, Suri thanked his voters and vowed to work for the betterment of Balochistan, from where he hails. "I thank every member of the parliament who voted for me," he said. "I also thank Asad Mehmood. "The PTI will pay special care to Balochistan. I have entered the parliament with this hope. Under Imran Khan's leadership we will turn Quetta into little Paris." Sadiq had earlier delivered a speech thanking his party (PML-N) and the former opposition for their support throughout his tenure, particularly during the 2014 protests and the circumstances that culminated in the resignation of PTI lawmakers. He congratulated Qaiser on winning the contest for the speaker's seat, and Shah for putting up a decent fight. "Many times I heard people call me a 'fake speaker' and tell me that 'we won't agree', but I didn't frown once," he said by way of advice to the incumbent. "Each second of each minute that I gave to the opposition (as speaker) is recorded. My government complained that I lean too much towards the opposition," he said. He also asked for all lawmakers to respect each other despite their differences. "I would like all of us to work for Pakistan's betterment," he added. He also lauded the passage of the Elections Act 2017, which was worked on by all political parties, but also mentioned shortcomings in Section 95(v) pertaining to the recounting of results at the time of consolidation of votes. He also regretted that the Election Commission of Pakistan did not execute its responsibilities as required, despite being given greater powers than before. "The house will decide whether we need to hold it [the ECP] accountable or not." "Everyone should be held accountable," he added. "Let us work for the betterment of Pakistan and the Parliament. We receive a lot of insults, no on appreciates our work. We have to make sure our work is appreciated," he said. "All of us wish to work for Pakistan, but it is also our right to play a role as the opposition," he later stated. PPP's Khursheed Shah struck a conciliatory tone, making a speech that focused on the promise that his party would never become a hurdle to the passage of legislation meant for the country's progress. 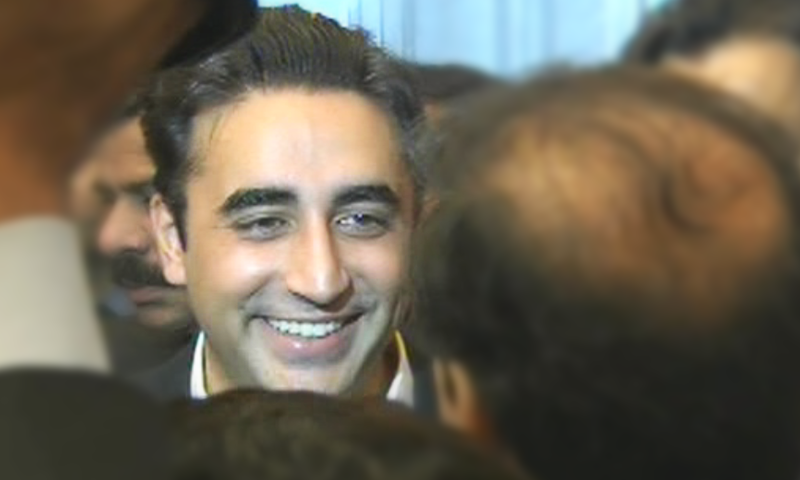 "Under Bilawal's leadership, we will fully play the role of a good opposition. It is our constitutional and legal right," he added. "Once more, we pray that this Assembly completes its five-year term in a democratic manner." PTI's Shah Mahmood Qureshi in a similarly diplomatic speech praised PPP Co-chairman Asif Ali Zardari for his "positive role" and "democratic behaviour". He also thanked Khursheed Shah for his "democratic views" and appreciated Shah's "political maturity". Qureshi observed that the lawmakers would have to exhibit such democratic behaviour to maintain the sanctity of the house in the years ahead. 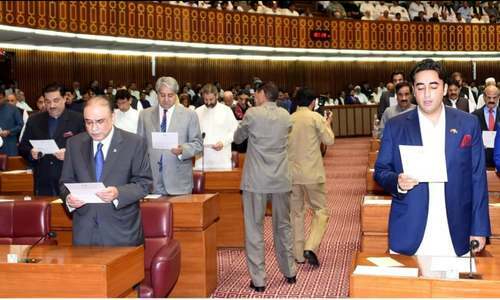 He also thanked the leadership of PTI's allied parties — the Balochistan National Party (BNP), the Muttahida Qaumi Movement-Pakistan (MQM-P), Balochistan Awami Party (BAP), PML-Q, Grand Democratic Alliance (GDA), and the independents who supported it in the speaker's election. He assured the opposition that the government would safeguard their democratic rights, and assured them that their criticism would be taken positively. The PTI leader noted that the country has been facing enormous challenges and that the government would need guidance from opposition lawmakers to cope with them. "All your positive points will be paid heed to; we have the courage to listen and we will try to act accordingly," he concluded. MQM-P leader Khalid Maqbool Siddiqui lauded the democratic transition of government and said it should be the first step towards change for a better democratic process in the future. "The people of Pakistan have entrusted their dreams to us; it is our responsibility to ensure they become a reality," he said. He also hoped that one day the common man would sit in Parliament: with farmers represented by farmers, and labourers represented by labourers. The NA has a total of 342 seats, including 272 general seats, 60 reserved for women and 10 for minorities. 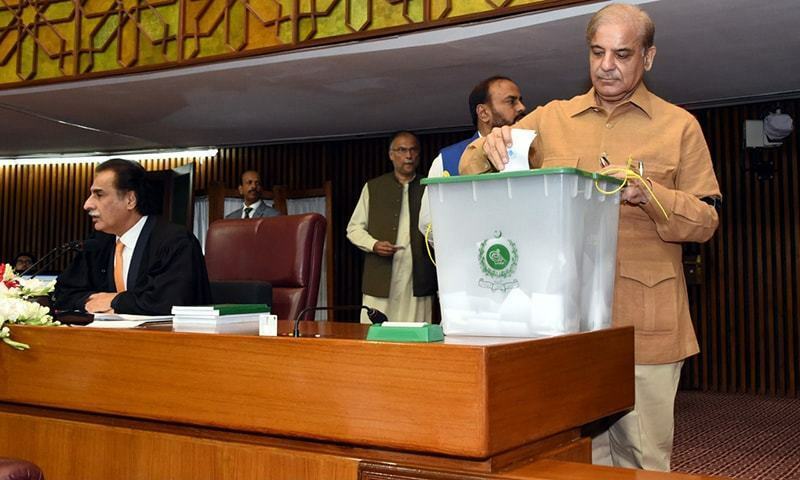 As polls in Rawalpindi (NA-60) had been postponed following the disqualification of PML-N leader Hanif Abbasi and elections in Faisalabad (NA-103) had been put off after the death of a candidate, the elections were held in 270 NA constituencies on July 25. 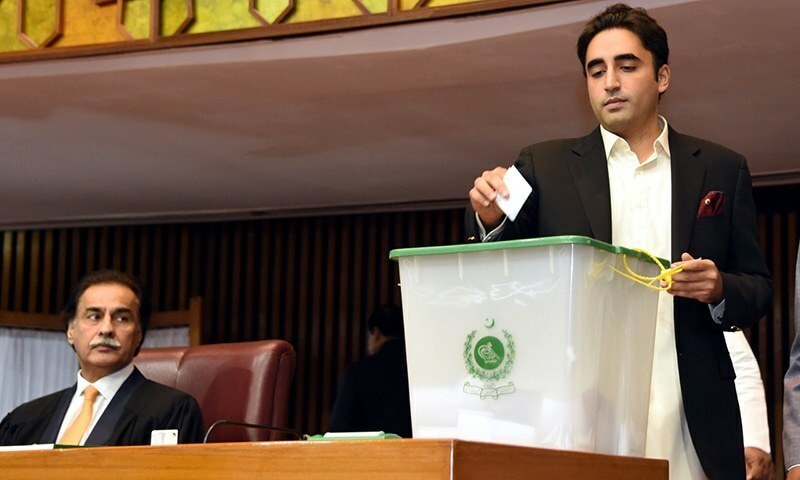 The results of only 339 NA constituencies, including the reserved seats, have so far been announced while the notification of PPP candidate Fida Dero’s victory from NA-215 (Sanghar), which had been withheld by the Election Commission of Pakistan, had not been issued till Monday evening despite the apex court order. 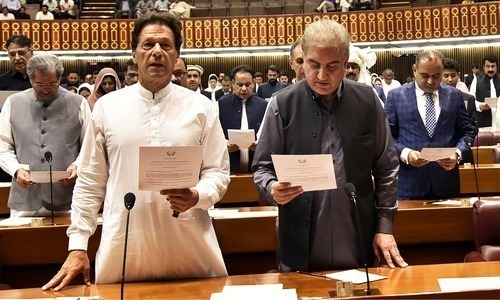 As many as 326 members had taken oath on Monday as Mehboob Sultan and Amir Sultan, the two brothers and PTI MNAs from Jhang, had not turned up at the inaugural session due to the demise of their mother. The PTI now has 152 members in the NA after Imran Khan, Ghulam Sarwar Khan and Tahir Sadiq vacated the additional seats. PML-Q leader Chaudhry Pervaiz Elahi, who had won two NA seats, has also opted for the Punjab Assembly seat. PML-N’s Hamza Shahbaz has also retained his Punjab Assembly seat and did not take the oath as MNA on Monday. 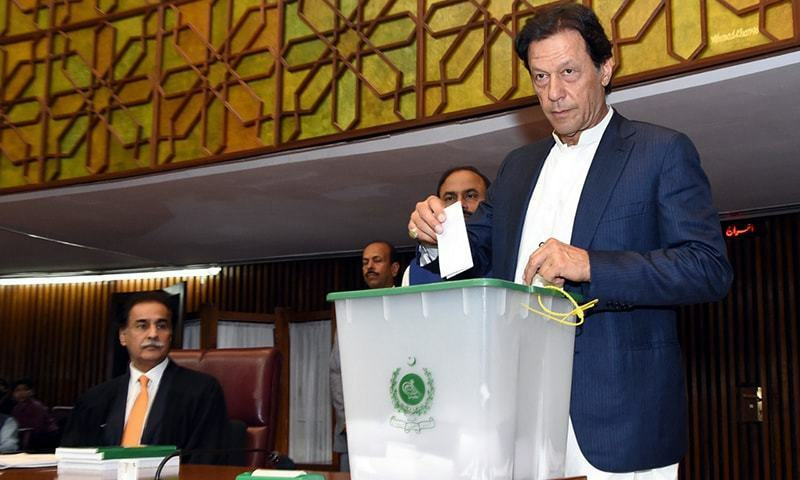 The parties that had already announced their support to the PTI or were expected to vote for its nominees were the MQM with seven seats; PML-Q and BAP with three seats each; BNP (four seats); GDA (three); and Awami Muslim League and Jamhoori Watan Party (with one seat each). Besides them, nine independents had joined the PTI. Four independents, who had decided to maintain their independent status, were also expected to vote for the PTI. Given the numbers, Qaiser was expected to receive around 180 votes in the election, against the estimated 150 votes for opposition candidate Khursheed Shah. In the first round, the speaker will be chosen in an NA session chaired by the outgoing speaker. The polling will begin once the NA is in session and all votes will be handed out by the NA secretary. No one will be allowed to take a photograph of their vote. Each nominee will choose two polling agents for themselves. Once all the votes have been cast, the speaker will announce that the polling process has concluded. Votes will then be counted in the presence of both candidates and their polling agents. Once the results are compiled, the speaker will proceed to announce the results. The outgoing speaker will then administer oath to the newly elected speaker. The same process will be repeated to bring in the new deputy speaker. The new speaker will supervise the election of the deputy speaker. If Shah wins, it will be disastrous for PTI. Let us hope for the best i.a. Best of luck to PTI. PTI should be able to have their own candidates elected - this will be a good victory for Imran Khan and rejection for PMLN, PPP and so called APC! PTI will win here as well. Good luck. KP speaker elections already won. "the session faced a delay of nearly one hour due to the late arrival of MNAs." Any comment needed? Our parliamentarians (old and new) deserve commendation for smooth political transition of National Assembly Speaker! Delivery on commitments is the only way to counter opposition. Otherwise PTI is in for a rough ride! The outgoing speaker was wrong to allow a PMLn member Murtaza Javed to speak after Asad Kaiser was elected as speaker. That was just an attempt to cause rumpus in the House. Paradoxically, Murtaza Javed screamed "vote ko izzat dau" by calling the whole process in Assembly 'unacceptable'! Opposition whose leadership is knee deep into corruption. I am sure they will get even less votes in the next general elections and will cry twice as loud. Really sorry to see the likes of Bilawal Zardari as MNA as he was elected just in the name of his assassinated mother and politically murdered grand father. Typical example of dynasty politics!! Best of luck PTI and please work honestly and stay on the ground . Unfortunate to see "eight rejected votes" polled by the lawmakers. What to expect from literates, especially those live in rural areas and particularly women. No hope for change in Pakistan, 71 years no change???? MNAs were late to get to the assembly. What more you expect of them? It is the duty of all members to make parliament powerful. PML-N law makers behaved shamefully. Carrying pictures of a convicted ex PM should disgust all law abiding people. 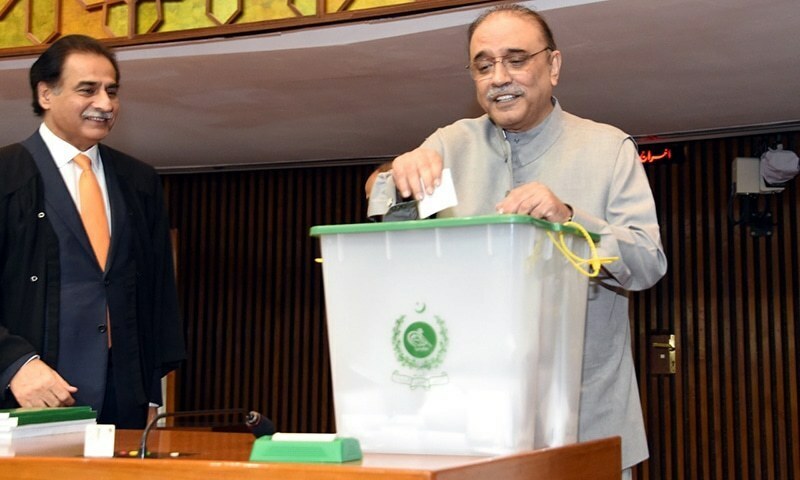 @zeeshandxb "Speaker is sitting while leaders are casting vote but standing when zardari is casting vote. food for thought" That was on Bilawal's request to make sure he doesn't vote for PTI. In my view, after announcing the victory for PTI candidate, the outgoing speaker (Ahsaz Sadiq) played a partial card and allowed deputy PMLN speaker to make negative and controversial statement on the floor. This was unnecessary, biased, unconstitutional and showed black side of PMLN! First Boundary of the game!!! I'm not here to wish good luck to a political party, its not about them, they are public servants, serving the people of Pakistan, if any one deserves the blessings and good wishes, its the people of Pakistan. Let us work together for the country, for the people, and more importantly, lets hold each and everyone one of our leaders accountable, whether they are in the government or the opposition. Asad Qaiser first looted Pukhtukhwa Assembly and now moved to National Assembly. PTI = the band of thugs. The eight rejected votes is questionable. Congratulations to PTI. Hope they will deliver. Pakistani Opposition in its ‘traditional’ role for the next five years. One hopes that the paupers who have entered the assemblies, when they leave, they will have enough money to provide for the coming generations of themselves as well as their kith and kin. Opposition wants to keep it ‘business as usual’ but they have another thing coming from IK. Time for the nation to give PTI a chance to start fixing the many Ills crippling Pakistan! Time for the media to highlight any obstruction by losing parties against such plans! I want to congratulate the new speaker of NA. But I am hurt to see that on the very first hour in the chair he (the speaker) is advised by a female member on manners of common nature. I have seen the very uneducated people all over Pakistan in social gatherings, punjabis/sindhis/pathans/baloch, almost every where to stand up when a female has approached. I do not understand why Mr. Asad could not extend this common courtesy to the female members in the National Assembly. I was watching on Television that he did not bother to stand up of his seat when the female members were approaching him after signing the register. Totally unacceptable behavior from a speaker of the NA. PTI, let’s get to work, no time to waste. 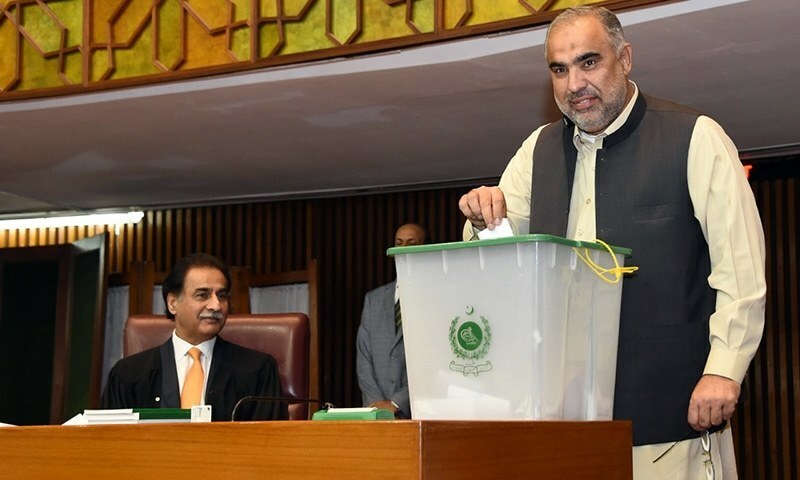 Shameful conduct of PMLN in the National Assembly.On one side they were raising slogans of ‘ Respect the Vote’, on the other side they were disrespecting the vote given in favour of the Speaker Asad Qaiser.Double speak and Disrespect of Law and Vote is the hallmark of PMLN. Innocent masses of Pakistan think that Jamaat-i-islami has been rooted out from electoral politics. If so, then who is Mahmood ur Rasheed? Babar Aawaan and Asad Qaisar? Its a die hard reality that PPP and JI are the mother of all parties in Pakistan. On a 2nd thought, not only a company merges into another, political parties also do. But it is unannounced and silent. Another term would be "Rent A Party". What a sad day for Pakistan to see the standard of National Assembly reach rock bottom.